You can never have too many slow cooker chicken recipes. At least I don’t seem to think so. I’ve made dozens of them and have oodles more on my waiting list. The newest one to show up for dinner was this Slow Cooker Cuban Chicken with Citrus from Quick Slow Cooking (Williams-Sonoma). 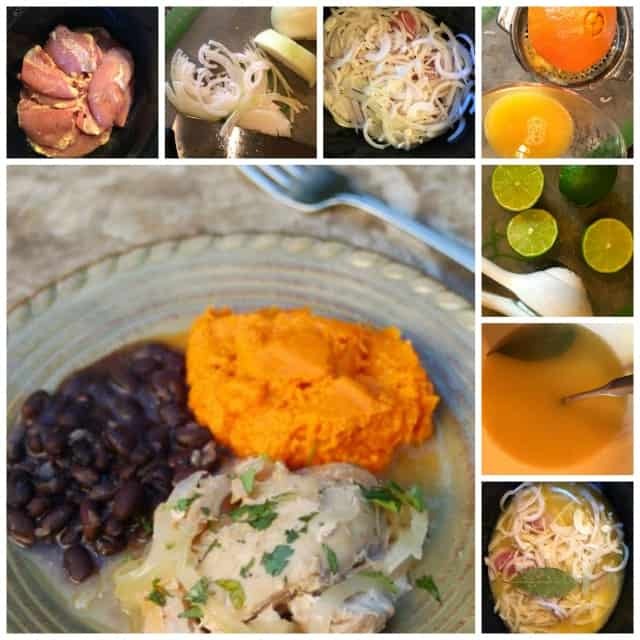 Fresh orange and lime juice combine with garlic, onion, and bay leaf, for an easy fresh and flavorful main dish. Oranges and limes are plentiful and cheap here in Phoenix right now, so it seemed like the perfect time to test out this yummy sounding recipe. As usual, I had my way with the original recipe. I replaced the suggested whole cut-up chicken with 8 boneless, skinless chicken thighs. And skipped the optional pre-browning in the name of time and laziness. To make sure the onion is soft by the time the chicken is done be sure to slice it as thinly as you can. I find it easiest to cut the onion in half lengthwise, then peel each half, place it cut side down and slice it into very thin half-moons. 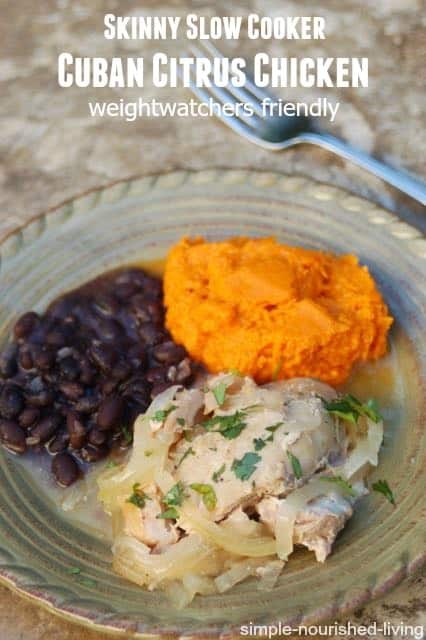 The book suggested serving this slow cooker Cuban citrus chicken with black beans, mashed sweet potatoes and sliced avocados drizzled with lime juice, which I did. Mom, Rod and I all gave this high marks for flavor. I appreciated how effortless it was, once the onion was sliced and citrus juiced. According to my calculations each serving has 239 calories and *6 Weight Watchers PointsPlus, *4 SmartPoints. 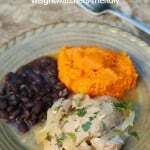 Simple, fresh and flavorful this slow cooker cuban chicken with citrus is as delicious as it is easy and healthy. For best results, be sure to slice the onion as thinly as you can. Season the chicken generously with salt and pepper and then place it in the slow cooker. Spread the onion evenly over the chicken and sprinkle with 1 teaspoon salt. Stir together the garlic, orange juice, lime juice and bay leaf and then pour over the chicken. Cover and cook on LOW for 6 to 8 hours, until the chicken and onions are tender. Remove and discard the bay leaf. Taste the sauce and add more salt and pepper to taste. Serve the chicken with some of the onions and a little sauce poured over. Source: Quick Slow Cooking (Williams-Sonoma) – A keeper, I’ve already made two recipes from it!